** 1982 - Merged with Norfolk & Western Railway (a Virginia company) to form Norfolk Southern Railway. + 1894 - Atlanta, Charlotte Air Line Railway. + 1894 - Blue Ridge Railway. + 1894 - Charlotte, Columbia & Augusta Railroad. + 1894 - Columbia & Greenville Railroad. + 1894 - Spartanburg, Union & Columbia Railroad. + 1895 - Asheville & Spartanburg Railroad. + 1898 - Carolina & Cumberland Gap Railway. + 1898 - South Carolina & Georgia Railroad. + 1900 - Lockhart Railroad. + 1903 - Union & Glenn Springs Railroad. + 1908 - Ware Shoals Railroad. (built by Southern Railway). + ~1940 - Carolina & Northwestern Railroad. + ~1940 - Rockton & Rion Railroad. + 1963 - Georgia & Florida Railroad. * 1894 - Merger of Richmond & Danville Railroad and East Tennessee, Virginia & Georgia Railroad to create Southern Railway. The early history of Southern Railway is traced essentially to the fortunes of the Richmond & Danville Railroad of Virginia. Immediately before and right after the U.S. Civil War, the Richmond & Danville Railroad sought to expand its market and to become a significant regional transportation system for the Southeastern states. It quickly moved into North Carolina with the construction of the Piedmont Railroad, which was hurriedly built during the Civil War, then after the war moved into South Carolina, Georgia, and Tennessee. Partially owned and financed by the state of Virginia, the Richmond & Danville Railroad's charter somewhat limited the company's ability to grow - it could only acquire other railroads that connected directly to its existing network of tracks. As the post-war economics grew tighter and competition grew more intense, the burgeoning railroad company came under the control of a group led by the Pennsylvania Railroad, operating through a holding company known as the Southern Railway Security Company. The Panic of 1873 led the Southern Railway Security Company to divest most of its hodlings, but it held on to the Richmond & Danville Railroad. Later in 1873, steamship operator Thomas Clyde purchased the Richmond & York River Railroad that connected Richmond with West Point, the departure point of Clyde's steamships serving Philadelphia and New York. Clyde completed a long-planned connection between his railroad and the Richmond & Danville Railroad at Richmond, and in 1875 the two companies entered into a traffic agreement. In 1880, the Southern Railway Security Company sold its shares of the Richmond & Danville Railroad to a syndicate led by Thomas Clyde and his son, William. The younger Clyde sought to expand the Richmond & Danville Railroad's sphere of influence throughout the Southeast, but was soon thwarted by the limitations in the company's charter. William Clyde then, in March of 1880, chartered the Richmond Terminal, which could have interest in any railroad, existing or to be constructed, in Virginia, North Carolina, South Carolina, Georgia, Tennessee, Kentucky, Alabama, Mississippi - later to include Florida, Louisiana, Arkansas, and Texas. Soon, the Richmond Terminal was engaged in both acquisitions and new construction. In 1880 and 1881, it bought up several small railroads in the Carolinas, Georgia, and Tennessee, and embarked upon a project to build a new railroad, the Georgia Pacific, westward from Atlanta, GA, through Birmingham, AL, and on to Greenville, MS, on the Mississippi River. The Richmond Terminal had originally been subordinate to the Richmond & Danville Railroad - a means for the R&D to circumvent the legal restrictions on its expansionist strategy. But since each company had securities that were traded in the capital markets of Richmond and New York, a complex web of ownership interests soon emerged. In 1886, a group of investors led by a New York-based financier, Alfred M. Sully, took control of the Richmond Terminal, and in December of that year, the Richmond Terminal took control of the Richmond & Danville Railroad. In the meantime, another rail system was being born to the northwest of the Appalachian mountains - the consolidation of the East Tennessee & Virginia Railroad and the East Tennessee & Georgia Railroad - to form the East Tennessee, Virginia & Georgia Railroad in 1869. In 1871, this growing railroad was also acquired by the Southern Railway Security Company - but, it was sold off by them in 1874. By February of 1887, the East Tennessee, Virginia & Georgia Railroad came under the control of the Richmond Terminal group. 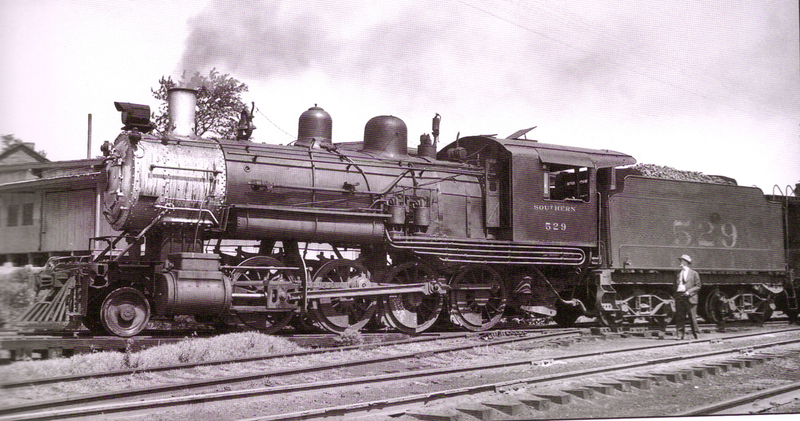 Around the same time, the Western North Carolina Railroad came under the control of the Richmond & Danville Railroad. The network was growing considerably. Next came the Central Rail Road of Georgia in 1888, which came under control of the Richmond Terminal. It was not folded into Southern Railway until 1963, however. Other more southern railroads were acquired between 1888 and 1894. By 1890, the Richmond Terminal comprised 8,883 route miles, and only the Santa Fe Railroad was larger within the United States. Because the organization's management structure was so loose and ill-defined, the various roads under control of the Richmond Terminal operated autonomously and even competed with each other by cutting rates. With an economic slowdown in the early 1890s, the Richmond Terminal suffered, as did most other railroads - and this led to the making of plans for reorganization, which went on for several years. In 1892, one group of stockholders requested that Drexel, Morgan & Company - the leading corporate banking house of the late 19th century, headed by renowned financier J.P. Morgan - to develop a plan for the company. By this time, the Richmond Terminal, the Richmond & Danville Railroad, the East Tennessee, Virginia & Georgia Railroad, and the Central Rail Road of Georgia were all in receivership. J.P. Morgan's plan was eventually accepted, but the economic depression that hit in 1893 did not help much. By June of 1894, the Morgan firm had completed the many legal and financial steps necessary to launch the successor to the Richmond Terminal. The new enterprise, charterd as the Southern Railway Company, began its life on July 1, 1894, with 4,400 miles of track. It was headed by Samuel Spencer, a Drexel, Morgan & Company railroad expert who had been involved in the reorganization from the beginning. Many of the smaller holdings of the Richmond Terminal were eliminated, to fend for themselves in those tough economic times. Southern Railway began by renegotiating contracts and leases currently held by all of its constituent railroads, and quickly folded in those it wanted to keep within its system. Those held by the Richmond & Danville Railroad and the East Tennessee, Virginia & Georgia Railroad were among the first to become part of the new Southern Railway. Between 1894 and 1900, Southern Railway acquired dozens of smaller roads in both North Carolina and South Carolina and added them to its network. By 1892, rail mileage in the South had increased to 30,173 route miles, with large systems controlling roughly 66% of this total. In 1899, total mileage in the South stood at 33,473, of which 76% was operated by ten major railroads. Southern Railway's beginnings included 4,400 miles of track in 1894, and this grew to encompass more than 7,700 miles by 1900 - spanning from Washington, DC, to Cincinnati, OH, to northern Florida. The early 1900s brought about more expansion, except for 1907, when a national "panic" hit - but, this was short lived, and Southern Railway began to modernize its entire system. As of June 30, 1914, its equipment roster included 1,663 locomotives, 47,992 freight cars, 1,134 passenger cars, and 1,340 cars used in maintenance. The Great War brought an increased set of challenges to the young system. By late 1917, the U.S. rail system as a whole was approaching the point of gridlock, most notably on routes to eastern port cities - bringing troops and material for the war effort. In December of 1917, President Woodrow Wilson seized control of the nation's railroads and put them under the direction of the United States Railroad Administration (USRA). Under USRA control, competition among railroads was eliminated in favor of a centralized, unified operation, whose goals included the utilization of the most efficient routes regardless of ownership, standarization of equipment, and consolidation of facilities. The war left Southern Railway with a treasury short of cash, a railroad with millions of dollars in deferred maintenance, and an uncertain outlook. To make matters worse, under USRA control, wages had escalated rapidly - producing a significant increase in operating costs after the war. But, the management at Southern Railway took it in stride, and again launched new modernization efforts, including investing in new facilities, heavier rails, more powerful locomotives, higher-capacity freight cars, and more modern passenger equipment. In 1928, the company opened a new headquarters building in Washington, DC, and at the same time moved a large number of accounting personnel from Washington to Atlanta, GA. The Great Depression brought more cost cutting and more debt, but by 1936, the tide had begun to turn, and the company registered a small profit that year. Years of renegotiating new loans after the Depression followed, and Southern Railway managed to upgrade its equipment as well as pay off all debts by 1952. The next interruption was, of course, World War II. More than 7,600 of Southern Railway's employees went off to war, and Southern was the first railroad chosen to help train members of the Army Transportation Corps in operating and maintaining a railroad. The favorable climate of the South made it a logical place for the U.S. military to establish training camps and other posts, and Southern Railway played a critical role in moving troops to and from these new facilities. Southern Railway operated nearly 16,000 troop trains carrying over six million service people across the South. Southern Railway was the first major railroad in North America to fully dieselize its train service. On June 17, 1953, a Southern freight train was pulled by the last regular-service train hauled by steam. The availability of diesels was a major factor in the favor over steam. In 1951, Southern Railway's freight diesels were averaging 9,000 miles of service per month. By contrast, ten years earlier, steam locomotives in freight service averaged less than 5,000 miles per month. The late 1950s to the mid-1960s brought on new acquisitions and more expansion. In 1960, longtime rivals Seaboard Air Line and the Atlantic Coast Line announced that they had agreed to merge. This announcement was not good news to Southern Railway. The unified Seaboard Air Lines and Atlantic Coast Line - to be known as the Seaboard Coast Line and to include the Louisville & Nashville Railroad - would have over 15,000 miles of track, versus the roughly 8,000 miles controlled by Southern Railway. Thanks to legal wrangling, the Seaboard Coast Line merger did not occur until 1967, with the Louisville & Nashville Railroad remaining as a separate entity, but under Seaboard Coast Line control. For all Southern Railway spend on lawyers in connection with deferring this merger, it ended up with little to show for it. Essentially, Southern Railway was allowed to drop trackage rights over various Atlantic Coast Line routes, which it might have been able to do absent the merger. Throughout the 1960s, most of the rail industry was preoccupied with mergers, but aside from its involvement in the SAL-ACL deferment, Southern Railway was essentially a bystander. In 1976, the Southern Railway system consisted of 10,494 route miles - Southern Railway Company owned 5,955 miles, the Central of Georgia owned 2,017 miles, and the rest was owned by smaller components. The year 1976 also yielded a financial milestone for Southern Railway - for the first time, the company generated more than $1 billion in revenues, more than double the $450 million recorded in 1967. In April of 1976, Southern Railway announced that it was discussing a possible merger with the Missouri Pacific Railroad. Although well matched, Southern Railway and the Missouri Pacific Railroad were not able to agree on terms - mostly attributed to their inability to resolve the issue of who would be in charge after the merger - so by September they agreed to go their separate ways. Two years later, Southern Railway looked at a possible acquisition of the Illinois Central Gulf Railroad, but this too went nowhere. Meanwhile, their competitor, Seaboard Coast Line, found yet another partner in the Chessie System, the parent of the Baltimore & Ohio Railroad and the Chesapeake & Ohio Railroad. In 1978, Chessie and Seaboard proposed a merger, which was consummated in late 1978 to form CSX Transportation, Inc. The only obvious move by Southern Railway was to merge with the Norfolk & Western Railroad. On December 4, 1980, the two companies filed their merger application with the Interstate Commerce Commission (ICC). This was approved in early 1982 and put into effect on June 1st - and the new company adopted its "Thoroughbred" logo and named itself as the Norfolk Southern Railway. Excerpted with edits from Southern Railway, by Tom Murray, 2007 Voyager Press. Excellent work with much more information and hundreds of great photos.